Sober Look: With high labor costs and leverage greater than Italy's, is France moving toward the periphery? With high labor costs and leverage greater than Italy's, is France moving toward the periphery? As the core nations apply pressure on the periphery to improve labor laws and reduce labor costs in order to become more competitive, the periphery nations would be able to point their finger back at France. The nation clearly needs to deregulate some of its labor laws, but with the new Socialist government likely to win the upcoming election, France will hardly be in a position to do so. 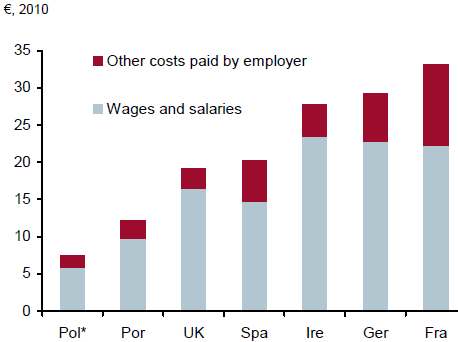 In France, the non-wage costs of employment are double those of Germany, and total wages have risen by 16% relative to Germany since 2000 and are now 14% higher than in Germany (indeed, the CEO of Peugeot pointed out that wages in France for autoworkers are EUR35 per hour compared to EUR10 per hour in Slovakia, part of the EU!). Hollande seems to have very few policies to address this. Clearly, raising the top tax rate to 75% could be counterproductive. High labor costs and employment protection laws (among the EU nations, France is the second highest on the OECD employment protection index, after Spain) are likely to stay or even get worse with Socialists in power. On top of that, France is consistently running a current account deficit that has been getting worse since 2005. 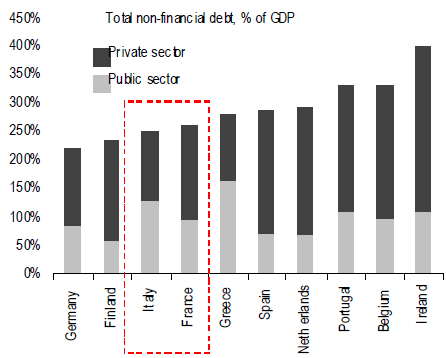 And even though its fiscal situation is still in a relatively good shape (that could change with the new government), France's overall leverage (including private debt) is actually higher than Italy's. A sharp economic slowdown could easily make the situation considerably worse. 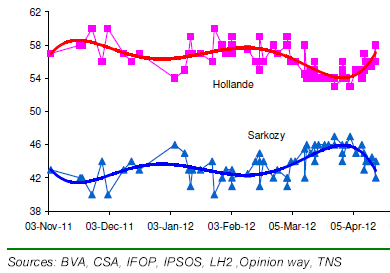 Update: It doesn't look to good for Sarkozy. The likelihood that the Socialists will be victorious in the upcoming elections is now quite high.